And herein lies the beauty of Nashville: while Mac's show at Exit/In is sold out, you can catch him in a few hours, for free. I once spent six hours outside of the HMV on 86th street in Manhattan with my friend Jared, just to get wristband for the chance to score a ticket to Jimmy Page and Robert Plant at Madison Square Garden. This meant getting to the store at 4 a.m., which, for a sixteen year old, is akin to some sort of torture, or at least something vaguely reminiscent of the kind of punishment awarded to a low level of criminals – a few of which we probably shared the street corner with that morning. We got the tickets, but I wasn’t so lucky a few years later when Radiohead came to town, and I lost out on both the lottery and general on-sale. Being that it was the time in my life when just the thought of Thom Yorke’s broken smile made my young heart approach something near psychotic Beatlemania-like proportions, I eventually shelled out hundreds of dollars on Ebay for floor ticket: a price that, for my college-age wallet, meant borrowed textbooks, not paying rent and eating microwaved potatoes for dinner for nearly a good three months. The whole thing was excellent for my waistline but horrible for my landlord. Normally we wouldn’t write about a sold-out show like Mac Demarco, because writing about sold-out shows is sort of like dangling a bagel around someone on an Atkins diet (I’d never turn down a bagel, fort he record); but here’s the thing: Nashville makes it possible to save time on street corners or money on scalped tickets because there’s a magical thing that happens here, which is when bands who sell out shows at Exit/In or the Ryman play for free around town, this time (and oftentimes, actually) at Grimeys. Had Radiohead added a pop-in at Tower Records, I might have saved my credit score. Mac Demarco makes a kind of relaxed, lax-voiced indie rock down the road of Pavement and Kurt Vile, and, because of some creative internet antics (cross-dressing, etc) has been labeled as “slacker-tunes,” so much so you expect to see him whip out a bong and play a song about skateboarding. But it’s really just some clever misleading from a 23-year-old eager to toy with critics (who have already created a near metagenre of Mac-Demarco-is-a-slacker-is-not-a-slacker journalism), who are already chomping at the bit to categorize his –and any – music. His name isn’t really even Mac Demarco (he was born Vernor Winfield McBriare Smith IV), and he doesn’t even get high – it’s a skewed, ambiguous identity that’s as much a part of his music as his meme. 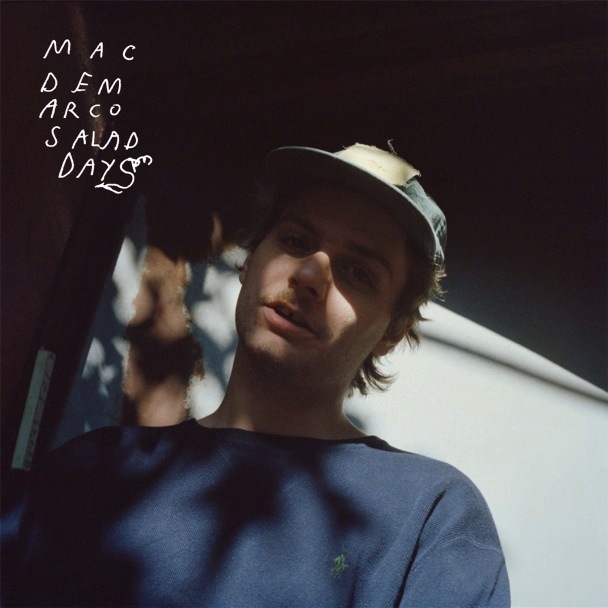 On the excellent Salad Days, his most recent release, you can find a selection of songs that slink along restlessly, floating from low-fi notes to sonically complex rhythms that play with ambient tones and dissonant melodies – it’s as slacker as Lou Reed was slacker, which is really not at all. Take the song “Goodbye Weekend,” which is mellow in tone but plays with off-kilter notes and subtle psychedelic pop; or the synthy “Passing Out the Pieces,” which sounds like a Brooklyn transported to Mars, hurtling through the molasses of rock ‘n’ roll space. Those of you who have tickets to tonight’s show at Exit/In: lucky you. But for those who don’t, make sure to get to Grimey’s early for the Mac Demarco in store at 6 p.m.: it’s free, saving your soul and your wallet. I’ll see you at both – and, if you bought your ticket on Ebay for an astronomical sum – teach you how to make a mean microwaved baked potato.